On the 8th and 9th of April we are holding a Tree Planting Weekend. Throughout winter we regularly cut down and prune trees to ensure the Park environment is maintained to a high standard. With 5 caravans to move over this last winter, we have had to fell 4 trees. 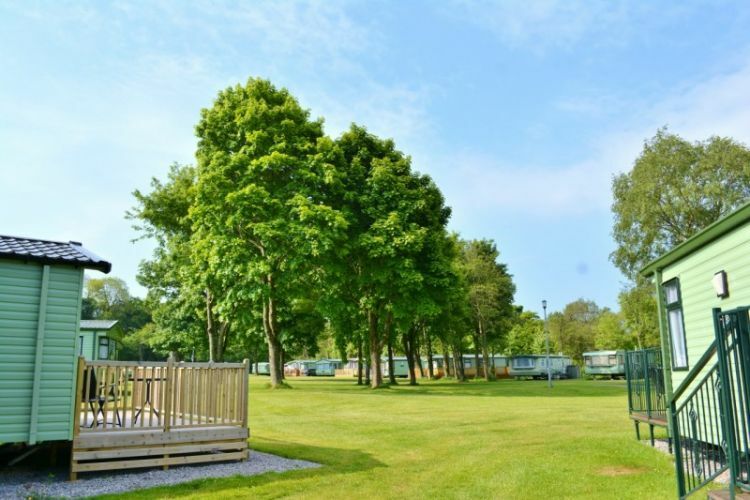 We also plan to cut a few of the larger, leaning trees down from the centre of the top field to ensure all caravans get their fair share of sunshine. After a lot of thought, we have decided that it would be lovely to start a small orchard on the Caravan Park, where caravaners who would like to take part in the event can choose what type of tree they would like to plant. You will then be able to hopefully pick your own fruit from the trees at the end of the season. The orchard will be located on the top field (see photo below), and we will be using only dwarf tree varieties to ensure we don't block anyone's view out of their caravan. The smaller trees will mainly be replacing the larger trees. Trees native to Teesdale will also available to plant. Over the next couple of weeks we will be sending out a form asking for anyone to register interest, and let us know which day would be preferable. As we will need to pre-order the trees based on the number who wish to take part, it's really important that you return the form if you're interested. This is a brilliant opportunity for you to have a long term input on the landscaping on the Park, as well as helping with vital environmental conservation. A hot lunch and beverages will be provided and served outside for all volunteers. You don't need any experience - although anyone with experience will be greatly appreciated!! All ages are welcome, and as usual we would love it if you are able to invite any family. As there will be a limited number of trees we can plant in one weekend, it will unfortunately be filled on a first come, first serve basis. However, if there is a lot of interest, it may be something we do again next year.